any of the large, mononuclear, highly phagocytic cells derived from monocytes, occurring in the walls of blood vessels (adventitial cells) and in loose connective tissue (histiocytes, phagocytic reticular cells). They are components of the reticuloendothelial system. Macrophages have their origin in the bone marrow, where they pass through the monoblast and promonocyte stages to the monocyte stage; the monocytes enter the blood and then the tissues, where they become macrophages. Macrophages are usually immobile but become actively mobile when stimulated by inflammation. Their functions include phagocytosis and pinocytosis, presentation of antigens to T and B lymphocytes, and secretion of a variety of products, including enzymes, several complement components and coagulation factors, some prostaglandins and leukotrienes, and several regulatory molecules. See also immunity. A macrophage ingests an antigen. From Polaski and Tatro, 1996.
alveolar m's rounded, granular, mononuclear phagocytes within the alveoli of the lungs that ingest inhaled particulate matter. armed m's those capable of inducing cytotoxicity as a consequence of antigen binding by cytophilic antibodies on their surfaces or by factors derived from T lymphocytes. (mak'rō-fāj), Avoid the mispronunciation mak'ro-fahzh. Any mononuclear, actively phagocytic cell arising from monocytic stem cells in the bone marrow; these cells are widely distributed in the body and vary in morphology and motility, although most are large, long-lived cells with nearly round nuclei and abundant endocytic vacuoles, endosomes, lysosomes, and phagolysosomes. Phagocytic activity is typically mediated by serum recognition factors, including certain immunoglobulins and components of the complement system, but also may be nonspecific for some inert materials and bacteria, as in the case of alveolar macrophages; macrophages also are involved in cell-mediated immune responses, participate in presenting antigens to lymphocytes, secrete a variety of immunoregulatory molecules, and interact with natural killer cells. /mac·ro·phage/ (mak´ro-fāj) any of the large, mononuclear, highly phagocytic cells derived from monocytes that occur in the walls of blood vessels (adventitial cells) and in loose connective tissue (histiocytes, phagocytic reticular cells). They are components of the reticuloendothelial system. Macrophages are usually immobile but become actively mobile when stimulated by inflammation; they also interact with lymphocytes to facilitate antibody production. alveolar macrophage one of the rounded granular, mononuclear phagocytes within the alveoli of the lungs that ingest inhaled particulate matter. armed macrophages those capable of inducing cytotoxicity as a consequence of antigen-binding by cytophilic antibodies on their surfaces or by factors derived from T lymphocytes. Any of the large phagocytic cells of the reticuloendothelial system. 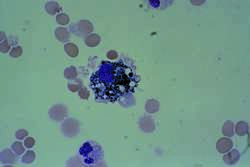 a granular mononuclear phagocyte that circulates as a monocyte in the blood and resides in all tissues. Macrophages recognize and engulf foreign materials and present fragments or epitopes on their membranes to initiate an immune response. Macrophages have many names, for instance histiocytes, reticuloendothelial cells, Kupffer cells in the liver, littoral cells in the spleen. Macrophages are the single most abundant cell in the human body, more numerous than skin cells or red blood cells. See also Kupffer cells, phagocyte, reticuloendothelial system. A nonspecific immune defence cell that interacts with proteins and polysaccharide antigens, internalising and partially degrading them, and/or presenting the antigens to T cells in a major histocompatibility complex (MHC) context. Macrophages are involved in secretion, immune interaction with T and B cells and provide lymphokine receptors; once activated, macrophages are highly microbicidal and tumouricidal, often closely associated with the blood vessels, epithelium and mesothelium, which are appropriate sites for non-specific immunocytes. Large (15–80 µm in diameter), often with bleb-like or filiform pseudopodia; one (or rarely more) round to oval, occasionally indented nucleus; nuclear membrane is distinct; nuclear chromatin is fine with a reticular pattern; abundant, pale grey-blue, often granulated (coarse azurophilic granules) and vacuolated cytoplasm with phagocytosed material (RBCs, WBCs, platelets, nuclei, bacteria and remnants in native or degraded form). Any mononuclear, actively phagocytic cell arising from monocytic stem cells in bone marrow; these cells are widely distributed and vary in morphology and motility; most are large, long-lived cells with nearly round nuclei and abundant endocytic vacuoles, lysosomes, and phagolysosomes. Phagocytic activity is typically mediated by serum recognition factors, including certain immunoglobulins and components of the complement system, but also may be nonspecific for some inert materials and bacteria, as in the case of alveolar macrophages; macrophages also are involved in both the production of antibodies and in cell-mediated immune responses, participate in presenting antigens to lymphocytes, and secrete a variety of immunoregulatory molecules. A monocyte that has left the circulation and settled and matured in a tissue. Macrophages are found in large quantities in the spleen, lymph nodes, alveoli, and tonsils. About 50% of all macrophages are found in the liver as Kupffer cells. They are also present in the brain as microglia, in the skin as Langerhans cells, in bone as osteoclasts, as well as in serous cavities and breast and placental tissue. Along with neutrophils, macrophages are the major phagocytic cells of the immune system. They have the ability to recognize and ingest foreign antigens through receptors on the surface of their cell membranes; these antigens are then destroyed by lysosomes. Their placement in the peripheral lymphoid tissues enables macrophages to serve as the major scavengers of the blood, clearing it of abnormal or old cells and cellular debris as well as pathogenic organisms. An important cell in the immune system. Macrophages are scavenging cells, large PHAGOCYTES derived from blood MONOCYTES, and are found all over the body, especially in the liver, lymph nodes, spleen and bone marrow. Some are stationary within the tissues (fixed macrophages), others are free and move about, being attracted to sites of infection. Connective tissue (fixed) macrophages are called histiocytes; those in the liver are called Kupffer cells; and those in the nervous system are called microglial cells. Macrophages are AMOEBOID and ingest foreign material and bacteria, which they destroy. 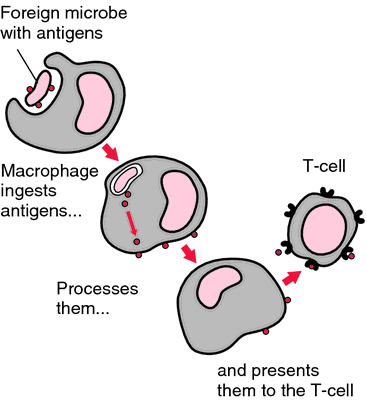 In order to bring about an immune response, most ANTIGENS must first be processed by macrophages so that their antigenic elements can be presented to LYMPHOCYTES on the macrophage surfaces. The term derives from the Greek macros , large and phageo to eat. 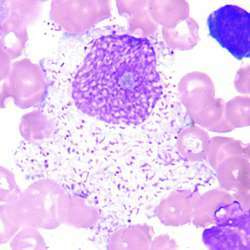 a type of scavenger cell that is widely distributed in large numbers in vertebrate tissues and which is derived from MONOCYTE blood cells. Its function is to remove debris, which it engulfs by PHAGOCYTOSIS, and it is capable of movement by means of PSEUDOPODIA. Macrophages occur in connective tissue, lymph and blood, and one of their important roles is the digestion of old and damaged red blood cells in the spleen. Some macrophages are free-moving, others are located in fixed locations (e.g. KUPFFER CELLS), the whole arrangement forming the RETICULOENDOTHELIAL SYSTEM. A large white blood cell, found primarily in the bloodstream and connective tissue, that helps the body fight off infections by ingesting the disease-causing organism. HIV can infect and kill macrophages. Any mononuclear, actively phagocytic cell arising from monocytic stem cells in bone marrow; widely distributed in body and vary in morphology and motility. n any phagocytic cell of the reticuloendothelial system including specialized Kupffer's cells in the liver and spleen, and histiocytes in loose connective tissue. See also histiocyte and monocyte. n a dust cell, coniophage, a vigorously phagocytic macrophage on the epithelial surface of lung alveoli where it ingests inhaled particulate matter.